Ever hear people say “There’s no money in music anymore.”? I hear it all the time and I’m calling shenanigans! 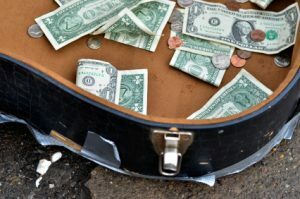 There are many ways to add revenue to your business as an indie musician! It’s not ALL about the almighty (or not so much) CD. These days you need to think outside the box. Focus on growing a loyal fan base and then give them creative ways (and many of them) for them to support you. Have a listen to this weeks episode to learn about some of these alternative opportunities that exist today. This episode has been brought to you by The Artist Promotion Blueprint. Learn how the “Fan Farming” strategy can be applied to your music career to not only dramatically increase your reach and your fan base but to also increase the quality of the fans themselves. Get started for free here.